A Few Things That May Be Of Interest To You: SLO County Public Works Department is in the throes of a circulation study for two very busy intersections in Avila Beach – Hwy 101 at both San Luis Bay Drive and Avila Beach Drive, plus consideration of a proposed plan for increasing parking in the downtown Avila Beach commercial area. To learn about what’s in store, just google SLO County Public Works, click on the listing, then when the home page pops up, click on the Current Public Works Projects tab located in the column on the left side. On the next page you will see a few project posting related to Avila Beach. Also in the works is a conceptual plan for Cave Landing natural area access improvements. Updates on this project can be found by googling SLO County Parks and Recreation. When at the home page, scroll down near the bottom to find the related story. Last but not least is the semi-annual reminder from CalFire Chief Paul Lee that with the recent time change comes the suggested task of placing fresh batteries in your carbon monoxide and smoke alarms. Thanks for always looking out for us, Chief! Archie McLaren told the story of his life to the staff of the Wine History Project to encourage others to continue to educate and celebrate the vineyards, the growers and winemakers of the Central Coast. His ability to build enduring relationships among writers, chefs and winemakers brought the California Food and Wine Revolution to SLO County, and generated over $3,000,000 for local charities through the Central Coast Wine Classic Events and Auctions over the last 30 years. Almost everyone in the county has been touched by his philanthropy and spirit. Archie lived in Avila Beach and was devoted to his community. He received national recognition during his life time and is honored as one of the Founders of the Wine History Project of SLO County which is dedicated to preserving and archiving local wine and food history and sharing it with the public through exhibits, lectures, films, books and events. Trolley Good Time: Yep, it’s almost time to hop aboard for this season of the Friday night Avila Farmers’ Market, which begins on April 5th. Avila Valley residents wanting to avoid traffic and parking issues can access the Free Avila Trolley at their stop on Ontario Road. Unfortunately, the prior stop in Avila Village has been discontinued due to logistical problems. To see and download the 2019 Avila/Pismo Trolley schedule visit: FREE! - slorta.org. Junior Lifeguards Program Gearing Up: With summer just around the corner, the staff of the Avila Beach Jr. Lifeguards Program are preparing for another robust season. This program, which has been supported for many years by the Port San Luis Harbor District, and the Avila Beach Community Foundation, focuses on character development and provides a rigorous curriculum on paddling, running, swimming, outrigger canoe, first aid, CPR, and basic lifeguarding. Open tryouts take place on April 28, May 5 and May 26. For more information about the process, visit www.avilabeachjuniorguards.org. Central Coast Aquarium is host site for ECOSLO’s Seas to Trees Countywide Clean-up Event. Scheduled for May 4th, CCA will coordinate divers to remove debris from under the Harford Pier beginning at 7am. And, the public is invited to help clean up Avila starting at 9:30am at the Aquarium. All participants will be treated to a BBQ lunch after the clean-up and can visit the Info Fair in the Ocean Discovery Park. To sign up: email at info@centralcoastaquarium.com or call 805-595-7280. We want to hear from you Avilones. Please keep an eye open later this month for a short survey being conducted by the Avila Beach Community Foundation. We seek your input to help guide our focus for the coming years, thus you will soon be emailed an opportunity to share your thoughts. Those who complete the survey will be entered into the drawing to win a $100 gift card to the Avila Beach restaurant of their choice. ​Greetings, fellow Avilones. I have much to share with you this issue, so rather than beginning with my usual opening dotted with witty repartee, I’ll get right to it. Update on the Print Version of the Avila News: At this point, we are still looking into possibilities for replacement of what had been a 15 year run, ultimately coming to an end with the closure of Tolosa Press. If anything comes forth, I’ll let you know. In the meantime, I thank you Foundation E-News subscribers for continuing to read our regular columns. Avila Beach Public Art Project – Phase II: A highly competitive process that brought forth nine beautiful artist proposals was whittled down to two finalists by our art selection panel. In a close race, the artistic project that emerged victorious is once again from Colleen Gnos, who also painted the murals that adorn the Avila Beach lifeguard towers and have gained much acclaim. The “canvas” for this project is a portion of the wall that surrounds the new Discovery Park entryway adjacent to the Central Coast Aquarium. Colleen’s murals will “explore our identity as ocean stewardship has shifted over the last 100 years; illustrating our relationship with the underwater environment in Avila Beach from past to present”. The visual story will serve to educate children and adults alike about human impact and relationship with Avila’s underwater species”. Colleen will begin painting the mural panels in her studio this spring, and installation is anticipated in the late summer 2019. 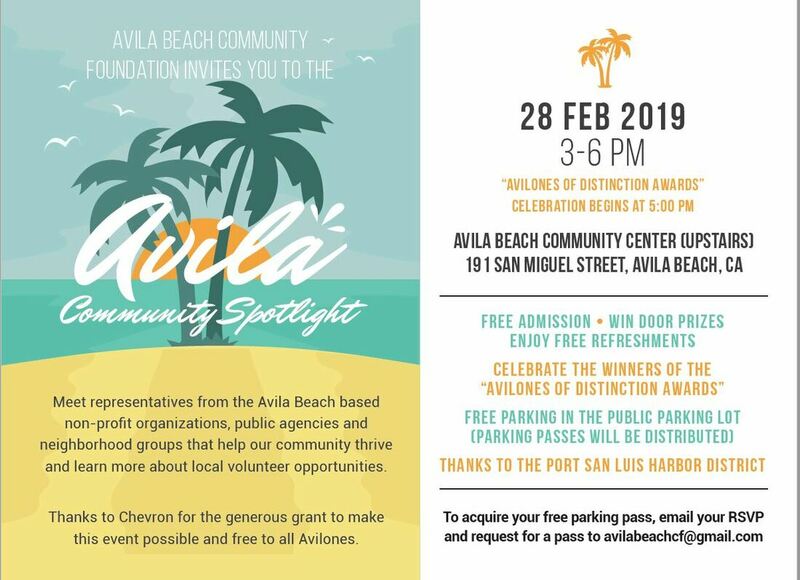 Avila Community Spotlight: The date for this first time, free Avila event is scheduled for February 28th, from 3:00-6:00 pm at the Avila Beach Community Center. If you haven’t already RSVPd or requested your complimentary parking pass (courtesy of Port San Luis Harbor District), please see the event flyer below for contact details. The “Spotlight” event is your invitation to meet the volunteers and staff of the local Avila agencies and community groups that help make our town the vibrant place we so enjoy. There will be lots of goodies to snack on and fun door prizes to be won as you explore the exhibitor tables, coupled with an opportunity to help celebrate the winners of the Avilones of Distinction Awards. You may recall that several months ago we sought nominations of Avilones who have, for many years, made a significant difference in this community. I am pleased to publicly announce the names of the three category winners in the hopes that you readers will be inspired to attend the celebration. Selected by an impartial panel to receive the award for Leadership is Anne Brown, for Volunteerism is Sherri Danoff, and for Philanthropy is Joan Sargen. Anne, Sherri and Joan will be formally recognized and presented their awards at 5:00p.m. I again thank Chevron for underwriting the cost of the “Spotlight”, so everyone can attend free of charge. Some Words Well Worth Sharing: I don’t often write to you about individual grants awarded by the Foundation, having chosen instead to inform about them in the collective sense. But after reading the 2018 year-end grant report narrative submitted by one of our grantees, I opted to make an exception. Following are some quotes provided by “graduates” of the Cancer Well-Fit program housed at the Avila Bay Athletic Club. Making an impact through the awarding of grants is something ALL Foundations strive to accomplish, and the Avila Beach Community Foundation is pleased to share the above example with you. Greetings, fellow Avilones. Here we are – 2019 has knocked the door down and entered the room. So, Happy New Year to you all! Last January I began my column with a few sentences about the state of our country, and speculated about future political unrest. If anything, I greatly underestimated what was to be. Our country seems even more fractured and divided than it was last year at this time. The major issues haven’t changed much, but the rhetoric has resulted in increasing extremism and hatred. With little relief in sight on the national and international front, I turn to my local hamlet for badly needed doses of normalcy, civility and decency. Avila Beach certainly has challenges, issues and divided interests, but it remains a community that offers more tranquility and quality of life than most places. I have friends on both sides of the political spectrum, but we agree to disagree without letting the differences hinder our relationships. Sadly, reason does not exist among the highest elected officials of the land, which in some cases filters down to the populace. Politics and global issues aside, this January presents a particular opportunity for me to reflect because it marks the 10-year anniversary of when I first became Executive Director of the Avila Beach Community Foundation. It doesn’t seem nearly that long, primarily because the time goes quickly since it’s a only a part time gig averaging about 12 hours per week over the course of the year. Plus, I really enjoy the work, which makes time fly. I’ve never before been employed at the same place for such a long period, but here I am, well into my retirement-age years, and grateful for the role. It has been a real kick to help distribute grants each year – well over $500,000 since I became involved – and to initiate a wide variety of projects and community enhancement activities. Likewise have I enjoyed working with my colleagues and the Foundation’s Board of Trustees since 2009 – a superb cadre of Avilones dedicated to our community. So, Happy Anniversary to me! Moving forward, I’d like to announce the “Foundation’s” Board of Trustees for 2019. Stepping into the role of President is Michael Ginn, who has been on our board since 2011. Our Vice President is Cyndy Lakowske, who joined the board in 2017. Continuing as Secretary is Gary Maier, now into his fourth year as a Trustee. Our Treasurer once again is Richard Zacky, who joined the board in 2014. Rounding out our Board of Trustees are Bev Aho (2016), Lucinda Borchard (2011), Saul Goldberg (2016), Percy Jones (2012), Barbara Nicholson (2018), Ellen Pitrowski (2017), Paul Prather (2016), and Brooke Salvini (2016). I feel extremely privileged to work with such a fine group of Avilones. By the time you read this column, the Avila Beach Public Art Selection Panel will have met and chosen either the finalists, or the winning project, from the ten proposals submitted. Said winner will be announced in the February issue of the Avila News. I believe we remain on schedule for the artwork installation to be completed by June of this year, after which will come the public unveiling. Watch for reports. Special thanks to Project Manager Gary Maier and Artist Facilitator Angela Tahti for their efforts to keep the ball rolling. You won’t want to miss the upcoming AVILA COMMUNITY SPOTLIGHT EVENT, so I urge you to grab your calendar and save the date of Thursday, February 28th, from 3:00-6:00 pm at the Avila Beach Community Center. This will be your opportunity to learn more about the Avila Beach based non-profit organizations, public agencies and neighborhood groups that keep our community humming along. Meet staff and volunteer leaders, mingle with friends, enjoy free refreshments, win door prizes, help us celebrate the winners of the Avilones of Distinction Awards, and more! This is a “can’t miss activity,” where attendance is free, and so is use of the public parking lot (parking passes will be distributed) thanks to the benevolence of Port San Luis Harbor District. Check out our website – www.avilabeachfoundation.org - and keep an eye open for event flyers and details. We thank Chevron for the generous grant to make this event possible and free to all Avilones. As is often the case when composing my columns for the Avila News, I again share with you some takeaway from the most recent meeting of the Avila Valley Advisory Council. What was notable this time was the size of the crowd in attendance. Showing up about five minutes early I discovered the only seats available were folding chairs along the back wall. Not a common occurrence, but the result of outreach conducted by the Concerned Citizens 4 Avila due to concern about a proposal in the county pipeline to expand the size and scope of special events at the Avila Beach Golf Resort. I offer no commentary here, but for those interested I suggest visiting www.concernedcitizens4avila.org. It is with deep regret I inform you that the print version of the Avila News you have been receiving in your Post Office boxes since 2009, or picked up at various community locations, will no longer be available. The publisher of the Avila News – Tolosa Press – has ceased operations of their local print news division, which has included the Coastal News and SLO City News, to focus solely on the company’s other services. The Avila Beach Community Foundation has covered the costs to have the print version of the Avila News mailed to 1,100 area households each month, at a total expense of over $40,000 since 2009. It is highly unlikely that another local news publisher will step up to fill the void. The “Foundation” will be in touch with the other Avila-based organizations whose information has regularly appeared in the Avila News to explore other ways to stay in communication with you loyal readers. In the meantime, I urge you to continue reading the “Foundation’s” E-Newsletter that will still be emailed to subscribers around the first of each month. And, I ask that you please encourage your neighbors who are not currently recipients of our E-Newsletter to subscribe at our website – www.avilabeachfoundation.org. Thank you. Greetings, fellow Avilones. ‘Tis the season we either look forward to, dread or something in between. I imagine emotions run the spectrum, what with traveling or hosting arrangements, purchasing and wrapping gifts, making New Year resolutions, tying up financial loose ends for 2018 and gearing up for 2019. Reminds me of the “shampoo, rinse, repeat” cycle on a different scale. Nevertheless it is a time for celebration and joy spent with those we cherish. Whatever you do, however you celebrate, I hope a little time can be taken to think about our neighbors in Northern and Southern California who have lost family members, pets, homes, peace and security due to the ravaging fires that have recently destroyed many communities. Life will never be the same for them. On a much lighter note in the spirit of gift giving, this is always the time of year when I get to announce the good news – that being the recipients of “Foundation” grants for the coming year. At our November meeting, thirteen grants were awarded, totaling nearly $56,000. Beneficiaries for 2019 funding are the Central Coast Aquarium, Avila Beach Civic Association, Cancer Well-Fit, Point San Luis Lighthouse Keepers, Avila Beach Jr. Lifeguards Program, People’s Self Help Housing, Port San Luis Harbor District, Bellevue-Santa Fe Charter School, the Surfrider Foundation and KCBX Public Radio. Plus, we will continue to support the Free Avila Trolley and home delivery of the Avila Beach News. For details about grant recipients and their specific programs, I invite you to visit our website – www.avilabeachfoundation.org. For several months I’ve been providing updates about a few “Foundation” activities in the pipeline, so here is the latest. A date has finally been set for our “Meet the Agencies Showcase”, although it will soon have a different title. Mark your calendars for Thursday, February 28th from 3:00-6:00 pm, at the Avila Beach Community Center. You are invited to meet members of the key organizations that help our community prosper, help us celebrate the winners of the “Avilones of Distinction Awards”, enjoy free refreshments, win door prizes, and more. Look for additional details next month. As for our Avila Public Art Phase II project, it is moving along and on schedule. Our project management team hosted an orientation for interested public artists in November at the selected site of the outside wall adjoining the Central Coast Aquarium. Artists with backgrounds in murals, mosaics, sculptures, and 3-D works were there to inspect the area and begin to formulate their ideas. Proposals are due by December 1st, after which the art selection panel meets – sometime around December 10th. The winning project will be announced on January 15, 2019, with the installation to be completed by June 30, 2019. This is also the time of year when I like to alert all you fellow Avilones of opportunities you have to help the “Foundation” support local projects and invest in local organizations. There are several ways to do so, such as establishing a Donor Advised Fund of your own, or by contributing to any of our existing Project Funds, including the Avila Beach Public Art Development and Restoration Fund, the Emerging Needs and Opportunities Fund, the Avila Beach Trails Improvements Fund, the Richard and Kathleen Zacky Family Foundation Fund, or the Joan Sargen Avila Beach Communities Enrichment Fund. Donations to any of these funds are fully tax deductible, and no management fees are taken by the Foundation. Please get in touch with me if you wish to discuss the possibilities. And don’t forget, any donation, regardless of amount, entitles you to receive one of our limited edition, “Proud Avilone” license plate frames! ‘Tis the season of giving. Finally, two things I remind you of each December. Cal Fire Battalion Chief Paul Lee says it’s time to change the batteries in our smoke alarms and check our carbon monoxide detectors. The seasonal changes in daylight savings each year are the perfect periods to complete these tasks. And be sure to always purchase your postage and ship your packages at our local postal outlet. Without sufficient revenue there is no guarantee that the Avila Post Office will always be here. Special thanks to the friendly, caring and helpful staff at the post office (Mary, Julie and Cindy). You ladies rock! ​That’s it for now, fellow Avilones. Have a wonderful Christmas, Hanukkah, or whatever it is you celebrate this time of the year. See you at the beach! Greetings, fellow Avilones. As we are about to embark upon another holiday season, starting with Thanksgiving, it is time to once again take stock of that for which we are thankful and fortunate. If you are reading this column, I imagine you are grateful for at least two things – being alive and residing in Avila Beach. When you think about it, that combination only applies to about 2,000 people, give or take, depending upon an actual census. In a world populated by nearly 8 billion people, we are just a blip on the map, but our good fortune tops the charts. This is also the time of year that the Avila Beach Foundation Board of Trustees convenes to determine how we will allocate grant funds for the coming year. As I’ve mentioned in the past, we usually earmark roughly 3% of the Foundation’s current investment portfolio value for local program and project grants. Last year the amount awarded was $64,590. It will likely be very close to that sum again this year. November 8th marks the date our Trustees come together to select grant recipients. Keep an eye out for the list of grantees that will appear in the December issue of the Avila Community News. Also rounding out the year for the Foundation will be the naming of winners of the previously advertised Avilones of Distinction awards. While there wasn’t the outpouring of nominations I hoped for, I am very pleased with the quality of those who were nominated – eleven Avilones in total – some of whom were nominated by multiple individuals. As a reminder, there are three categories of recognition – Volunteerism, Leadership, and Philanthropy. Each category winner will receive a $500 honorarium that will be donated to an eligible Avila Beach charity of their choice, courtesy of a grant from our friends at Chevron. The list of candidates is impressive, and reflects a collective dedication to the Avila Beach experience. Stay tuned for the big announcement. Last month I reported that Phase II of the Avila Beach Public Art project was finally gaining some forward momentum upon the hiring of an experienced public art consultant to help facilitate the process. By the time you read this column, a “Call for Artists” Request for Proposals (RFP) will have been released (scheduled for October 15th). Proposals are due by December 1st, the winning project will be chosen on January 15th, and the artwork installation will be completed by June 30, 2019. This schedule represents our anticipated timeline and is subject to alteration if necessary to ensure the best possible outcome. I promise to keep you informed of our progress. Speaking of public art, you may recall that last year we offered everyone a unique opportunity to make a donation to the Avila Beach Public Art Phase II Fund, and be rewarded with our limited edition “Proud Avilone” license plate holders. As you know, we reached our fundraising goal of $25,000. And guess what! We still have some “Proud Avilone” frames in stock (see below), which can be acquired for a donation of any amount. This offer is just in time for those looking for a special Christmas or Hanukkah gift for your Avila Beach friends and neighbors. Be sure to include your contact information so we can arrange delivery of your frame(s). That’s it for now, fellow Avilones. I wish you an enjoyable Thanksgiving celebration. See you at the beach! Greetings, fellow Avilones. This month’s column begins on a very sad note, that being the passing of the “Foundation’s” Board President, Lisa Ritterbuck, who in early September lost her year-long battle with cancer. Lisa joined our board in 2016, and in 2017 was elected President – an early recognition of her leadership abilities and desire to contribute to the well-being of Avila Beach. We did not get to enjoy Lisa for very long, but will remember her always. Our condolences go to Lisa’s husband, two school-age children, and parents Mike and Shirley Ritter. You will be missed, Lisa. While I find it difficult to follow the first paragraph with other news, I will give it my best. So, how about if I share with you Avilones a few tidbits of the cruise my wife and I recently took along the northeast coast? It started in Boston, where we spent a day sightseeing – mostly along the Freedom Trail – along with a brief detour to visit to the famous “Cheers” bar, which was the filming site of the television show by the same name. The visit was brief because the crowd inside was huge! And no one yelled “Rick” when we entered. Boston must be doing well economically, because a great many cranes could be seen in commercial areas throughout the city. And one could easily see why public transportation is the primary way to get around, what with the narrow streets and limited parking available. As a Southern California native, riding the subway and trains doesn’t look very appealing to me, but is certainly a way of life and necessity in many metropolitan cities. Heading north we stopped first in Bar Harbor, Maine, then at several ports in Nova Scotia. Each small town had its own unique characteristics, and I couldn’t help but notice the clean streets, parks large and small, and abundant public art scattered about. One thing that really caught our eyes was the presence and volume of wooden Adirondack chairs throughout all the Nova Scotia towns, so invitingly placed everywhere for people to just sit down and enjoy the surroundings. And many of the chairs were grouped together with public art themes painted on the chair slats. Something similar could be really colorful and cool here in Avila Beach. After Nova Scotia, our ship landed in Quebec City, Canada. What a wonderful city! Walking along the historic residential section nearest the port, we noticed that most of the old homes, in spite of sitting on huge lots, do not have garages or carports. I found this odd because of the cold winters in Canada, and my belief that vehicles have difficulty starting if left outside overnight in freezing weather. So, while walking along we came across an elderly gentlemen whose car was parked on the lawn in front of his house. We stopped, engaged him in some light conversation, and I asked about the absence of garages. He stated proudly that they did not need them, because Canadian cars have learned to adjust to the cold weather. We all shared a chuckle over that. Into Montreal we sailed – a much larger city than I imagined – though they’ve had over 400 years to mature. Another sight-seeing extravaganza with countless centuries old buildings, cathedrals, monuments, residential areas and parks all packed into a three hour bus/walking tour. As with the Nova Scotia stops, we again noticed how the public and commercial areas were so clean and well maintained. Our Montreal tour guide made it a point to inform us that this level of cleanliness was not always the case, and litter once ruled the day. The local government addressed the problem creatively by pouring funds into educating youth attending school about the importance of maintaining a clean environment, and encouraging the students to pass along those values to their parents and older relatives. It reminded me of the time when many of us California Baby-Boomers while attending elementary school were taught by local fire departments how to help make our homes safe from fire hazards. We taught our parents what we learned at school, and it seemed to work, didn’t it? Okay, you’ve heard more than enough about my travels, so now onto a few more pieces of “Foundation” news before I run out of space. First, I am pleased to inform you that Pacific Gas and Electric Company recently awarded us a $2,500 grant, to be added to our Avila Beach Public Art Fund. This is just the latest round of support we have received from PG&E, and we are most appreciative of the company’s years of generosity. And speaking of public art, after months of my previous reporting on the issues that have stalled our forward momentum, I can finally inform you that we have engaged the services of former ARTS Obispo executive director, Angela Tahti – who was instrumental during our first public art installation – to help guide us through round two. Angela will be working closely with “Foundation” board secretary, Gary Maier, who is also serving in the capacity of project manager. Stay tuned for project progress updates. That’s it for now, fellow Avilones. I hope you are enjoying the post summer tranquility we all look forward to. See you at the beach! ​Greetings, fellow Avilones. I begin this month’s column with a nod to those in Avila Beach who toil behind the scenes as volunteers, donors and leaders of the local non-profit, community/civic/public service and neighborhood organizations. Roughly 45 years ago I began my journey into the non-profit sector. It was as a tennis instructor at the YMCA in Van Nuys, California that I first became aware of community organizations heavily reliant on volunteers and donors. During my first summer of employment at the “Y”, I was invited to be a volunteer travel camp counselor for a group of youth going on a five-day river rafting trip in Oregon. Little did I know then that I’d spend the next 4+ decades working for, then leading, several volunteer and donor driven community organizations. One of the constants over my career is the realization that the overwhelming majority of people who volunteer and/or make financial contributions do so with little or no expectation of being recognized for their efforts. Gratification comes in the form of knowing what they do can make a difference in the lives of others. So, in my professional opinion, it becomes the job and privilege of non-profit agency staff and others in the community to help shine a light on those who selflessly give of their time and resources, above and beyond the call of duty. Last month I told you about the “Avilones of Distinction Awards,” initiated by the Avila Beach Community Foundation in conjunction with our 20-year anniversary. We are seeking everyone’s help in identifying people in our community with a deep history of devotion to Avila Beach through volunteerism, philanthropy or leadership. Please visit our website – www.avilabeachfoundation.org - and click on the information about the “Avilones of Distinction” nomination process. Announcements of this opportunity can also be found below, or in the print version of the Avila Community News. The nomination deadline is October 1st, and it takes only a few moments and thoughtful text on your part to help the community recognize the notable achievements of our friends and neighbors. Speaking of volunteers and opportunities……………….. Concerned Citizens for Avila (CC4A) will be hosting their annual meeting on Wednesday, September 12th, 2:00 p.m., at the San Luis Bay Mobile Estates, Indian Hills Clubhouse. 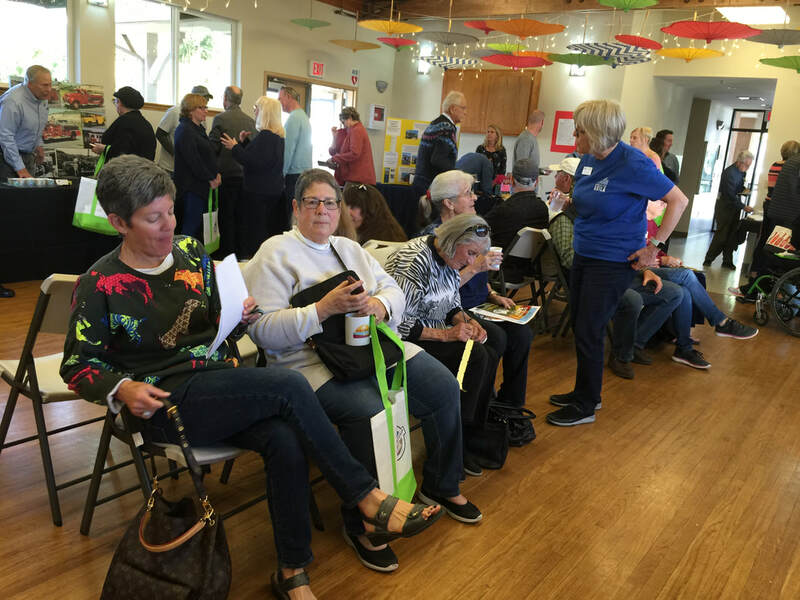 Avila Beach residents are invited to hear a recap of the accomplishments achieved by CC4A over the last three and a half years since the group formed. Says CC4A leaders, “we will discuss the challenges of what lies ahead, and our hopes for the future. Together we can protect the natural environment, safety and accessibility of Avila”. For those who plan on attending that live outside the San Luis Bay Estates, please email concernedcitizens4avila@yahoo.com so the gatehouse can be notified. Also, CC4A is looking for a volunteer with 2-4 hours per month available to help with their monthly newsletter. Criteria for this position includes: (1) Good writing, editing and proofing abilities. (2) Computer skills: Email, MS Word, willingness to learn Google Docs, document filing and retrieval. (3) Develop fluency with software: Constant Contact (training available). (4) An understanding of the issues facing Avila and how CC4A is involved. (5) Ability to incorporate emails from board; send out drafts and revisions. (6) A flexible schedule. If you are interested, email concernedcitizens4avila@yahoo.com. ECOSLO has announced the 34th annual California Coastal Cleanup Day, an international day of cleaning our coastlines, creeks, and lakes, which is scheduled for September 15th. Volunteers are needed to participate, and may choose from a list of 35 site locations here in SLO County, including; Avila Fisherman’s Beach / Olde Port Beach, Avila Beach (meet at Central Coast Aquarium), ​​Bob Jones Trail (meet at Avila Pier), and Pirate’s Cove / Cave Landing. Sign up ahead of time to help ECOSLO estimate the amount of supplies to bring per site. Invite your family, friends, a local club or organization to join you, and enjoy a morning of helping care for our beautiful coastline and waterways. For more information visit the ECOSLO website at www.ecoslo.org. A comprehensive guide to services for senior citizens, their family members and caregivers is published every two years by the Area Agency on Aging of San Luis Obispo and Santa Barbara Counties. Known as the “Senior Information Guide”, the 2018-2020 SLO County version of the “Guide” is now available and can be picked up at the Avila Beach Community Center. This directory is a valuable tool that covers more areas related to seniors than I have space in this column to share, and contains 114 pages of must-have information. As summer in Avila Beach is now coming down the home stretch, I hope you all enjoyed the season, spent extra time traveling or hanging out with family and friends, and generally “chilled out” during those lazy, crazy, hazy days of summer. We still have a couple months of extended daylight and warm temperatures remaining, with fewer visitors around our popular town and beaches. So, get out there and have some fun. That’s it for now, fellow “Avilones”. See you at the beach! Greetings, fellow Avilones. The Dog Days of Summer aren’t just when your pooch starts panting on a sweltering summer day, or when you are grilling some dogs on the BBQ. According to The Old Farmer’s Almanac, the Dog Days of Summer are traditionally the 40 days beginning July 3 and ending August 11, which coincide with the dawn rising of Sirius, the Dog Star. I imagine most of you recall last month’s 5-day heat wave, which resulted in 100+ degree days here in Avila, with very little relief at night. Raise your hand if you wish you had air conditioning, or a backyard pool in which to plunge and cool down. I suppose one solution is to jump into the ocean! Parting is such sorrow, thus it is with sadness that I announce the departure of the “Foundation’s” Project Specialist for the past three years, Paula Dempsey, who is cutting back on the number of jobs she has been juggling for quite a while. Paula has done a tremendous job for us, and will be greatly missed. At the same time, I am excited to welcome new “Foundation” Project Specialist Stephanie Rowe. Some of you readers may already know Stephanie from her work as Administrator for the Avila Beach Tourism Business Improvement District, or from when she and husband Rick lived in Avila prior to moving to SLO. My appreciation goes to Paula and Stephanie for facilitating a smooth transition. In a quick act of heroism following the July 4th graffiti tagging of a painted mural panel on one of the Avila lifeguard towers, to the rescue came artist Colleen Gnos and husband Che Miller. In all likelihood most of you never even saw the ugly ‘TBM’, international gang tag. The swift action of Che and Colleen to remove the graffiti within twelve hours restored the artwork to original form. Such was possible because of the coat of anti-graffiti sealer previously applied to the painted murals, along with some cleaning solvent and elbow-grease courtesy of Che. Quite naturally, this leads to fears that more vandalism could be coming our way. Public art belongs to all of us, so I hope you Avilones will help us be vigilant, and on the lookout for depraved individuals who get a kick out of destroying things. Let’s not allow the bad guys to win by taking away our pleasures. Did you happen to notice the greeting cards display rack that now occupies a small corner inside the Avila Beach Post Office? I was delighted to see this time and travel saving opportunity to avoid trips into SLO or to South County to purchase greetings cards. How convenient! As I’ve written in the past, it’s important for us to support our neighborhood post office, which continually has to prove its financial viability to keep the doors open. So drop a few bucks there the next time you need a card. Now I wish I could enjoy a place in Avila that sells fresh donuts! It’s amazing that in the absence of a convenient establishment, my cravings for donuts grow ever stronger. Aw heck – now I need to go in search of an apple fritter! A few months back I mentioned the “Foundation’s” 20-year anniversary, and our pending plan to celebrate that milestone by launching the first ever “Avilones of Distinction” awards. Well, that time is NOW, and we are presently accepting nominations until October 1st. If you know any Avilones you deem worthy of consideration to be recognized for their efforts to help make Avila Beach a wonderful place to live through Volunteerism, Philanthropy or Leadership, please visit our website – www.avilabeachfoundation.org – and download the nomination form and instructions. In addition to receiving community recognition, a $500 donation provided through a generous grant from Chevron will be awarded on behalf of each category winner to an Avila Beach charitable organization chosen from a list of eligible agencies. By now, I’m sure most of you have noticed construction at the Avila Beach Bridge. Here is an explanation provided by the SLO County Dep’t. of Public Works…… ……“The SLO County Dept. of Public Works has begun a seismic retrofit project on the existing Avila Beach Drive Bridge over San Luis Obispo Creek. The bridge provides the only public access road to Port San Luis and Diablo Canyon Power Plant. A 2010 PG&E study on evacuation routes identified this bridge as a concern of potential collapse during an earthquake. The seismic retrofit will assure the evacuation route and upgrade the bridge to current codes. The retrofit elements include cable restrainers and strengthening of bridge connections, a new approach slab and stabilization at the east end of the bridge, removal and replacement of unsound concrete on the bridge supports, removal and replacement of existing asphalt on the bridge surface with a new polyester concrete deck overlay. Following the bridge retrofitting, work on the roadway will begin AFTER Labor Day. No roadway work will be done during weekends or holidays, and will occur only during off-peak hours with single-lane closures, anticipating maximum 10-minute delays. Bicycle and pedestrian traffic will be maintained at all times during construction. Work is expected to be completed by the end of 2018”. That’s it for now, fellow “Avilones”. I hope you enjoy the rest of the summer. See you at the beach! Greetings, fellow Avilones. July is now upon us, and things in Avila Beach are once again holding seasonal form. Even though weekend traffic and parking continues to be a problem, it seems to have gotten worse with the present amount of new housing construction popping up all around us. And this is not just an Avila Beach problem – no, it seems to be occurring in many parts of SLO City and South County as well, causing rush-hour traffic on the 101 not seen five years ago. But to put things into perspective, I must admit to a “reality-check” vacation to Palm Springs that my wife, dog and I took in early June. On the way home we experienced at least three major traffic jams, on a Saturday morning, mind you, and wound up spending seven hours in the car – about two hours longer than usual. Ugh! We visit the desert three or four times annually, and each year traffic gets worse in both directions. So, I can’t complain too much about the extra five or ten minutes it takes to get around on the Central Coast. In case you haven’t seen prior announcements about local code enforcement response in Avila Beach, extended hours assistance is now just a phone call away for Avila Beach residents. I believe this is in response to the increasing amount of concern expressed at Avila Valley Advisory Council meetings. According to SLO County Department of Planning & Building representative Art Trinidad, “this service will allow people to report violations such as unpermitted grading, work that is causing environmental damage, unpermitted temporary events, and violations of event conditions that often occur on weekends outside of Code Enforcement’s normal business hours.” County Code Enforcement Officers are now on call Fridays from 5:00pm -10:00pm and Saturdays, Sundays and holidays from 8:00am-10:00pm. The number to call is (805) 788-2350. During normal business hours, residents can call in reports at (805) 781-5600. I imagine that many of you attended the June 28th Envision Avila Workshop, and learned more about the process and community workshop series created to inform and develop a new comprehensive Community Plan in Avila Beach. Community Plans are an integral part of the San Luis Obispo County’s General Plan that manages what exists now, what may exist in the future, and guides land use decisions for the next 20 years. The Avila Community Plan will specifically focus on the region within the Avila Urban Reserve Line (URL). This painstakingly long process has been underway for a couple of years now, and will not be completed for several more. Rather than get into the details here, I encourage you to visit the Envision Avila website and snoop around – www.envisionavila.org. As I turned the page in my old fashioned Day Runner notebook to the month of July, I was reminded that it’s time to begin working on the “Foundation’s” annual grant making process. The first steps entail updating the request for proposals (RFPs), placing the application form on our website, and alerting all past applicants and recipients of due dates and timelines. Interested parties will have roughly two months to complete and submit their requests for funding. Then it takes us about two more months to facilitate the competitive selection process. For the staff and board members of the “Foundation”, grant-making season is one of our most important and rewarding periods. It is our opportunity to re-connect with current grant recipients, and meet new applicants hoping to secure funds for their projects or programs. Historically, we have about $60,000 to allocate each year, and typically award 10-12 grants. The amount given each year is attached to the value of the “Foundation’s” professionally invested and managed portfolio, of which a percentage – roughly 3% - is set aside for grants. Our funding practices are consistent with other community foundations, and enable us to give responsibly and effectively. For information about our grant-making process, and/or to download the application form for 2019 programs or projects, please visit www.avilabeachfoundation.org after July 10th, and click on the grants tab. Or feel free to call me at (805) 595-4095. That’s it for now. See you at the beach! Greetings, fellow Avilones. Summertime in Avila Beach here we come! I certainly don't need to tell you what to expect, but I guess it's okay to remind you to prepare and plan for any trips into or out of our soon to be stretched to the limit cozy beach town. I have a lot of content to share this month, so I'll get right into it. First, it is my extreme pleasure to introduce Barbara Nicholson as the "Foundation's" newest member of our Board of Trustees. A native Washingtonian, Barbara moved to SLO County in 1996 and worked as a Retail Application Consultant for SAP, as Retail Market Manager for Dioptics, and as Advertising Sales Rep for national and major accounts for The Tribune. Barbara shifted gears and in 2006 was hired as Executive Director of Partnership for the Children of San Luis Obispo County, which operates Tolosa Children's Dental Center for Medi-Cal and uninsured children. Currently Barbara works as an independent Event Coordinator specializing in small community events. In 2016, she and husband Howard, a Real Estate Appraiser, moved to Avila, where they reside in the Indian Hill community of the San Luis Bay Estates with Rusty (cat) and Sampras (dog). Welcome, Barbara! You loyal readers may recall that in last month's issue of the Avila News, I devoted some space to the presence and importance of local volunteer intensive community groups that help keep Avila Beach ticking. One of the newer such groups is "Concerned Citizens of Avila Beach", which I've mentioned in past columns. I decided to interview the group's current President Betty Hartig to give you a greater idea of the work they do. Here goes . . .
What is your role with "Concerned Citizens"? I am the President of CC4A and conduct all meetings of the Board. I also serve as a representative of the organization in meetings and discussions with other organizations and agencies. I send and sign letters, such as the recent letter to County Parks regarding fire safety concerns at Cave Landing. However, our seven member Board works together on all aspects. When was the organization established, and why? CC4A was initially founded in March 2015 out of concerns raised by the Wild Cherry Canyon Development, a huge housing project proposed for that pristine area. There were also other extensive projects with applications that had been submitted to the Department of Planning at that same time. The idea of large development creating more traffic and threats to the environment without well thought out mitigations and limitations galvanized citizens to act together. CC4A became a formal organization in June 2017 with established Bylaws and a Board of Directors. What is "Concerned Citizens" current area of focus? The mission of the organization is to protect the natural environment, safety and accessibility of Avila. We are concerned with traffic congestion that presents a significant risk to visitors, employees, and residents due to Avila's solitary road in and out, fire danger, tsunami potential and nuclear facility. There are currently four extensive projects that have been submitted. The present threat to public safety and welfare in Avila due to road congestion would be magnified by further development. If a fire or any type of emergency evacuation were to occur in Avila, how could people leave safely and in a timely manner? We have asked the County Board of Supervisors to put a hold on development until the update of Avila's General Plan is completed. How can members of the community get involved with "Concerned Citizens"? We encourage the community to sign up for our monthly newsletter by visiting www.concernedcitizens4avila.org. We keep the community aware of issues and concerns, as well as provide updates regarding projects. Right now, we need volunteers to help organize and participate in community events that CC4A would like to host. You can also send an email to concernedcitizens4avila@yahoo.com and let us know your interests. More good reviews for the now famous murals affixed to the Avila Beach Lifeguard Towers! This project, launched by the Avila Beach Community Foundation and completed by local artist Colleen Gnos, was just named "Best Public Art" project in the New Times Best of SLO County Poll. We are delighted that the entire community has come to appreciate this unique display of Avila's storied past. Stay tuned for updates on our Phase II Public Art Project. It's progressing a bit slower than we had planned, but moving forward nevertheless. That's it for now - see you at the beach!